November may be over, but I’m still writing with new word count goals. In NaNoWriMo’s past, I have been so burned out after a month-long writing marathon, I needed a break from writing. And while a break is well-deserved, the longer the break is, the harder it is to get back into the habit of writing every day. Sometimes if you haven’t touched your laptop in a while, you begin to fear it. You’re afraid to start typing and you’re afraid not to start typing. Writing becomes a stranger—and without realizing it, you’ve closed the door on your closest friend, your imagination. This year, I decided not to take a break after NaNoWriMo. I’m going to maintain my habit of writing everyday. In tracking my writing sessions throughout November, I noticed that I write well in short bursts, writing several hundred words in twenty or thirty minutes. Some days, it would take three separate writing sessions throughout the day for me to reach the daily goal of 1,667. And when I fell behind, I had to write even more to try to catch up. 1,667 words a day is a decent goal, but one I have trouble maintaining regularly. I’ve decided to shoot for 500 words a day, six days a week. If I write more than 500 in a day, even better and allowing myself one day off a week gives me a little flexibility. Word count isn’t the only way to set a writing goal. You can set milestones in your story to write certain scenes or get to a particular point in the story arch. 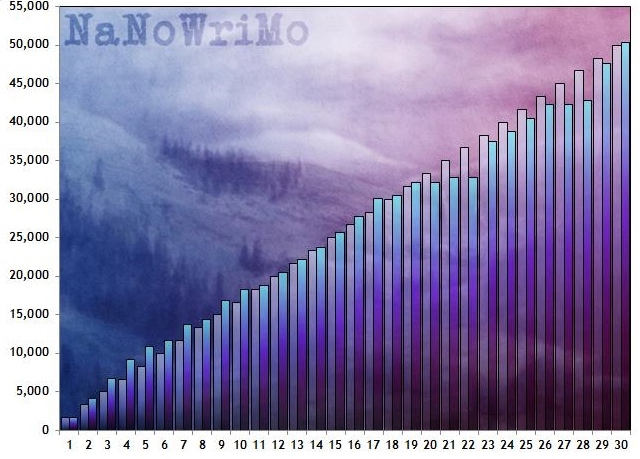 Are you setting any post-NaNo writing goals? Let’s hear ’em!